BERKELEY, CA - (@The Comedy News) - Julia Yalda spent all of Friday afternoon with her boyfriend Claude preparing to host some friends for a Shabbat dinner. The cuisine was typical: challah bread, Manischewitz wine, felafel, and Israeli cucumber salad. The guests---fellow classmates from the University of California-Berkeley---were ready for a Friday night feast. And the main dish Julia was most excited about serving was a recipe she concocted on her own: an organic, gluten-free, fat-free, lactose-free, vegan noodle kugel. Culinary professors say that the best noodle kugels should be approximately 2,000 calories per serving. 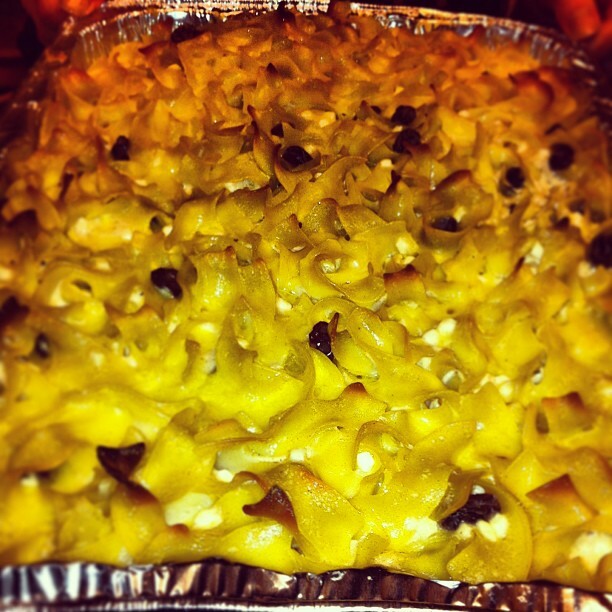 Julia's healthy kugel is about 200 calories per serving. "Shabattie hotties and shalomie homies! I give you the healthiest noodle kugel the world has ever tasted!" 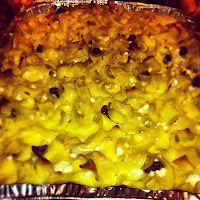 Julia announced as she plopped square hunks of a wet yellow noodle kugel on her guests' plates. Unfortunately, none of Julia's nine guests enjoyed the healthy kugel---including her boyfriend. At first, the guests were put off by the pungent smell of the kugel as Julia walked from the kitchen-end of her studio apartment to the makeshift dinner table. Lauren Sweiren, a friend of Julia's since freshman year, sent a mass text to three other attendees: "WTF did Jules slaughter a cow in here???!" After each guest was served a festering pile of Julia's healthy noodle kugel, she sat intently staring with her eyes open, teeth showing, hands clasped on her boyfriend Claude's shoulder. "Oh Jesus Mary and Joseph!" Shouted Julia's friend Yoni Rosenblatt as he took his first bite. Julia cut off Yoni and asked, "I know, right? Deelish! And so healthy too!" "I thought there's supposed to be raisins in this, not edamame. Ick"
"I'd rather be obease than suffer the indignity of eating this JennyCraigKugelCrap." "I'm breaking up with her, not kidding." ":))))) JK. Shld hav eatn taco bell." One guest, Shana Bloomquist suggested out loud that they all take a bite. A series of ankle kicks were sent her way from around the table. Approximately 52 minutes after the first bite of kugel was eaten, all of the guests stood up in unison and left Julia's apartment. Not getting a clue at all, Julia wished all of her guests the best and a good shabbos. Each of the nine guests, including her now ex-boyfriend Claude, went to a local tavern and did tequila shots until they got the taste of the world's healthiest noodle kugel out of their bodies and memories. 20 ounces of cooked vegan noodles made by the hippie commune in the alley behind the house---must NOT have FDA approval. 1) Grease 13x 9-inch pan with "I Can't Believe It's Not Butter---Vegan Gluten-Free edition"
3) Combine all contents in pan. 4) Bake for one hour at 350 degrees Fahrenheit. 5) Serve with plenty of napkins for spitting, and hair-ties for long-haired friends who are likely to regurgitate shortly after consuming.